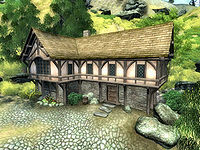 Gottshaw Inn is an inn on the Gold Road between Kvatch and Anvil. It is found east of the Brina Cross Inn, northeast of Garlas Agea and west of Kvatch. The publican, Foroch, offers basic Mercantile training. He rents rooms for 10 gold per night. He sells only wine and food, but will also accept potions in trade. The ground floor contains the reception area consisting of a bar with a counter and a small dining and sitting room. Another, smaller, sitting room can be found just inside, while the rooms are upstairs. The room you can rent is at the far end of the corridor; it contains a middle-class single bed, a chest of drawers and two draperies. The room next to yours, which is locked, has the same arrangement, but is darker, and contains a single bed you can sleep in. The other room, next to the stairs, is also locked and is spacious and well-lit. It contains a chest, a writing desk and a double bed, which is free to sleep in. There is also an unowned sleeping mat in the nearby stable. An Imperial Legion Soldier can be found frequenting the inn. This page was last modified on 13 May 2018, at 21:34.